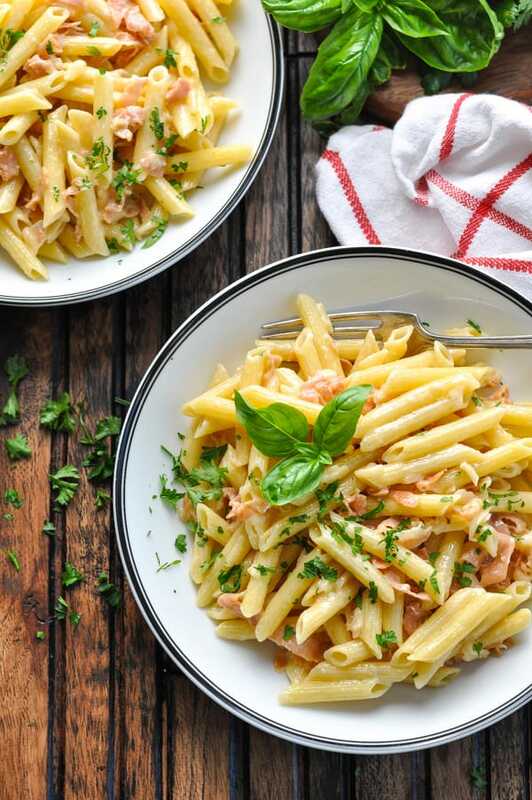 Whip up a delicious, authentic Italian dinner in less than 20 minutes with this 5-Ingredient Penne with Prosciutto Parmesan Cream Sauce! 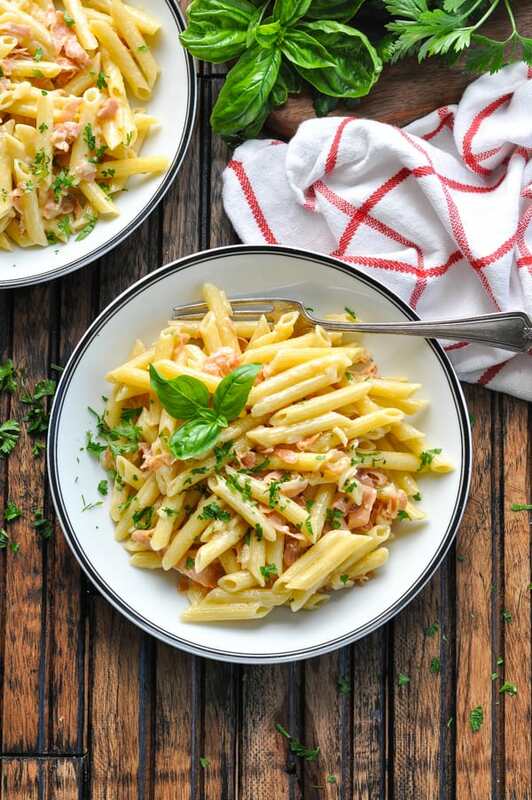 Whip up a delicious, authentic Italian dinner in less than 20 minutes with this 5-Ingredient Penne with Prosciutto Parmesan Cream Sauce! 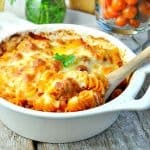 The easy pasta recipe is a family-friendly option for your busiest weeknights. It may sound indulgent, and it certainly tastes that way, but this creamy white sauce isn’t overly rich — thanks to just a touch of heavy cream. 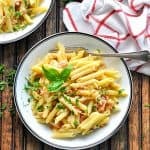 The Parmesan cream sauce is made without flour, and lightly coats each bite of penne pasta for the perfect Italian flavor in a fresh, simple meal. 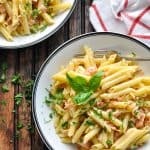 What makes this Penne with Prosciutto Parmesan Cream Sauce so special? 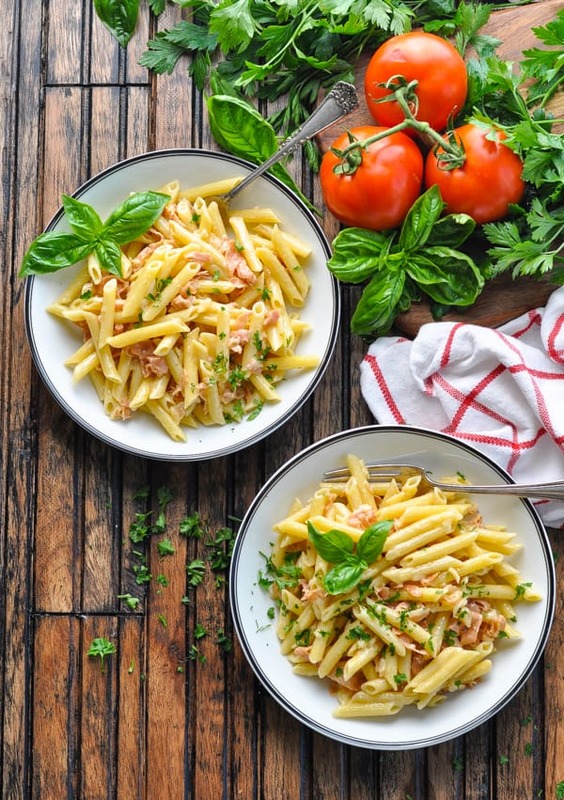 It takes advantage of some of the finest, authentic Italian ingredients for maximum flavor with minimal effort! 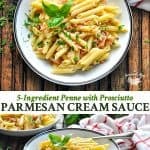 How do you make a Prosciutto Parmesan Cream Sauce for pasta? 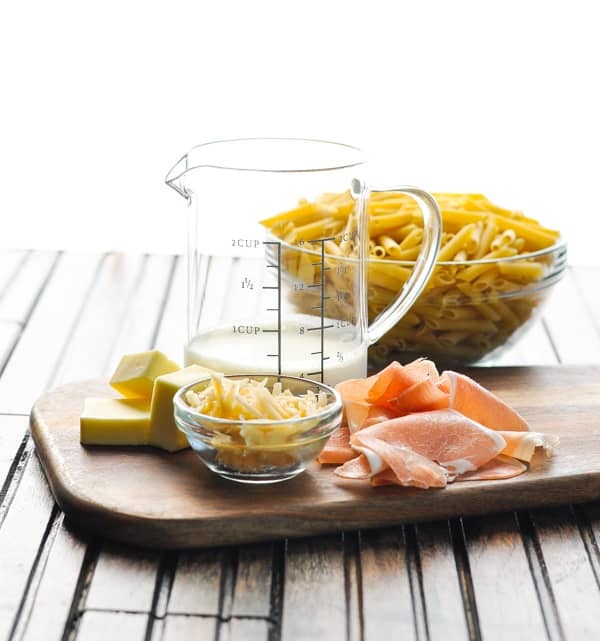 Let’s start with the 5 basic ingredients: penne pasta, heavy cream, butter, prosciutto imported from Italy (Prosciutto di Parma PDO), and Parmigiano-Reggiano PDO cheese. When using minimal ingredients, it’s important to choose the finest, highest quality options. That’s why I recommend using authentic, Italian-imported goods for the best result. There’s truly no substitute for Prosciutto di Parma PDO and Parmigiano-Reggiano PDO. Check the label to be sure that you’re purchasing genuine products from Italy. Just because they look Italian, doesn’t mean that they are Italian! The minimum maturation period must be 12 months, and it gets its unique flavor from the intense bacterial activity of the indigenous microbial flora in the special local milk. Parmigiano-Reggiano PDO is only produced within a certain region in Italy, and first references to this hard cheese are dated back to 1200-1300. Today the Parmigiano-Reggiano PDO is still produced with the same ingredients, techniques and tradition of these years — and you can taste the authenticity! 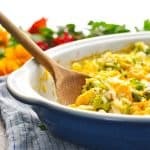 For this recipe, you want to make sure that you’re freshly grating your cheese (don’t use a jar of the pre-grated stuff)! Now let’s chat about the Prosciutto di Parma PDO! This cured ham is 100% natural, made without any additives, such as nitrates, nitrites, preservatives, hormones or coloring agents. It can only be produced in the hills around Parma, where the air is dry with aromatic breezes from the Apennine Mountains. This region creates the perfect conditions for the natural curing of the hams, which are aged at least 12 months before receiving the official stamp of certification. 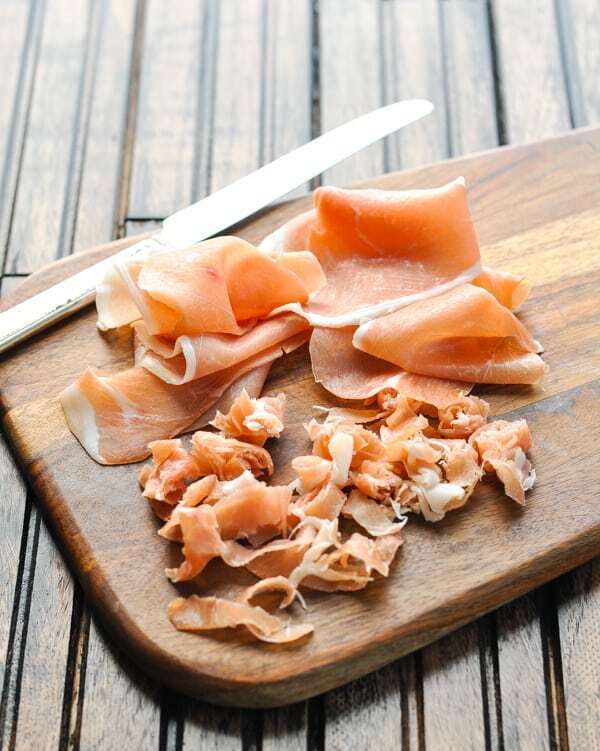 Prosciutto di Parma PDO has a mild and delicate taste, with a fragrant aroma. 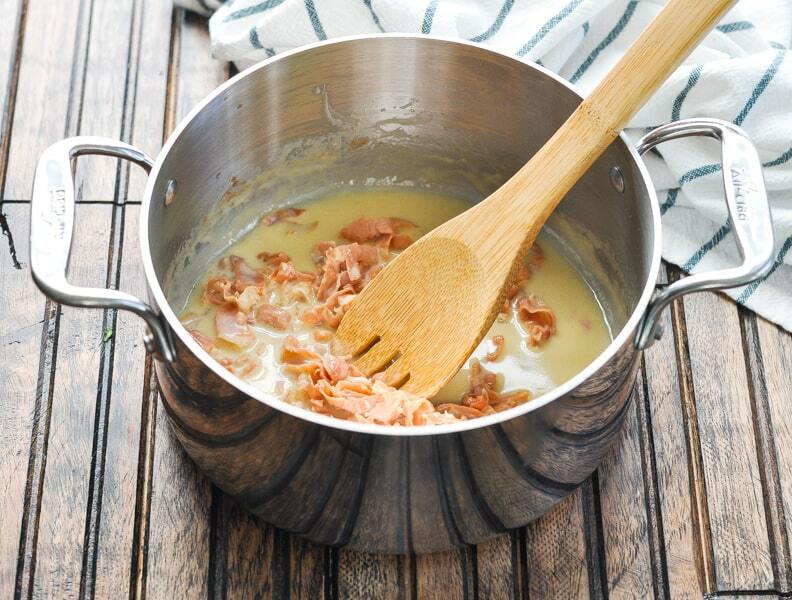 Here, you’ll need to slice the meat into thin strips before adding it to the Parmesan Cream Sauce. 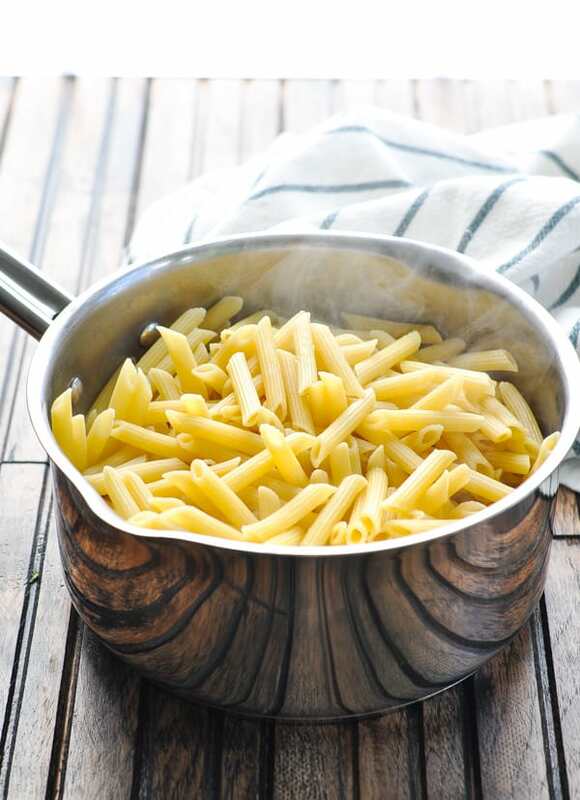 Once your ingredients are prepped, begin by boiling the penne pasta according to package instructions. 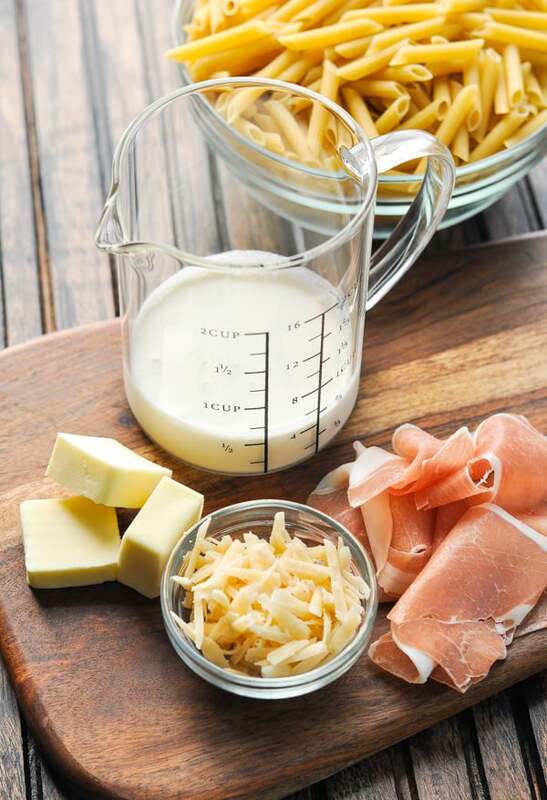 While the pasta cooks, prepare the Prosciutto Parmesan Cream Sauce. 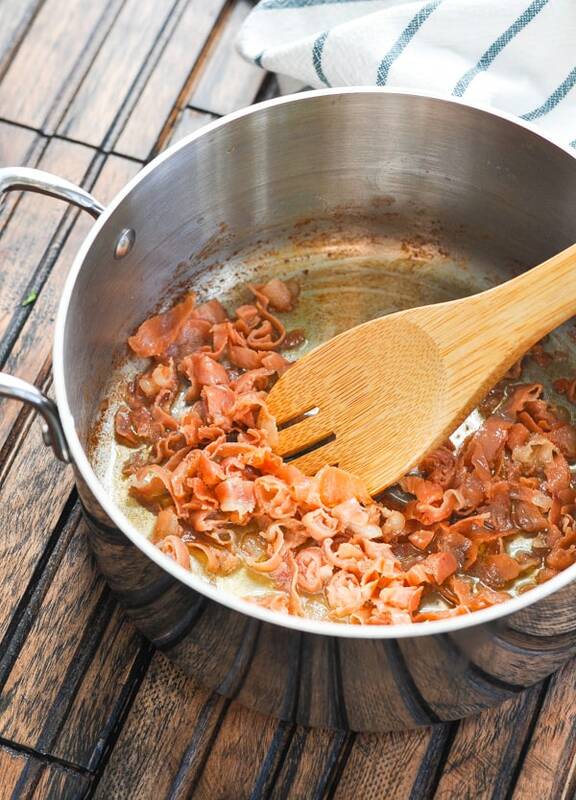 First, melt the butter in a saucepan, add the prosciutto, and cook until the prosciutto is browned all over and slightly crispy. Add the heavy cream to the saucepan and cook over low heat, stirring frequently, until the sauce thickens (about 3-4 minutes). Toss the sauce with the cooked penne, stir in the grated cheese, and serve immediately! I like to garnish the bowls with fresh herbs, but that’s certainly not necessary. 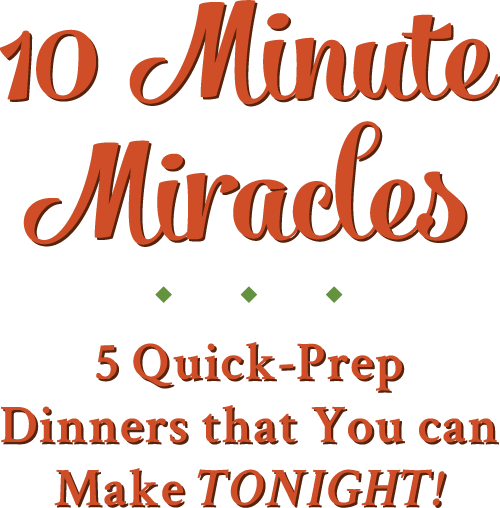 I know that you’ll want to dig in right away! This truly is the perfect Parmesan Cream Sauce for pasta. It doesn’t have to be complicated or time-consuming to taste amazing — especially when you’re working with the finest Italian ingredients. That’s amore! Discover more about the never ending journey through the unique and authentic Italian flavors! Cook penne pasta according to package instructions. Drain. Melt butter in a saucepan over medium heat. Add prosciutto and cook for about 3-4 minutes, stirring a couple of times. The prosciutto should be browned all over and slightly crispy. Add the heavy cream to the saucepan and cook over low heat, stirring frequently, until thickened and reduced by at least one-third (about 3-4 more minutes). 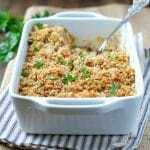 Toss the cream sauce with the cooked penne, stir in grated cheese, and serve immediately. Garnish with fresh chopped parsley or basil and extra cheese, if desired. 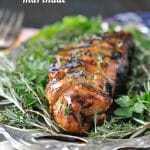 This recipe yields 2 very large servings, or 4 smaller servings. If you're cooking for a big family, I suggest doubling the recipe. Isn’t pasta the best? You’ll love this version! This is so simple! I’ll be making this soon for sure!! I hope you will, Karly! 🙂 We just had it again last night. It’s so easy and so fast!